(Ming Pao) Last year, a number of judges at the Shenzhen Middle Court were placed under "double regulations" on suspicion of corruption. According to <Democracy and Legal Times>, the court decided to take corrective action by hiring a fengshui master to study the court house. The master pointed out that the building has three "evils" that affected fortunes negatively. First, the east side of the building faces a factory smoke stack that is several dozens of meters tall, and this required the casting of spells to ward off the evil. Second, the west side of the court house was too dark and a stone lion was required to ward off the evil. Third, there were eleven steps on the first stair at the plaza on the east side of the court house and this is an absolute taboo. Therefore, the stair has to be modified to nine steps. When the construction was effected, the fengshui master observed that there were dark spots on the material and therefore the steps were demolished and re-built immediately. Apart from the fact that it was illegal for the court house to modify the building without the approval of the planning department and the municipal administration, there may also be legal problems concerning the spending of public funds. (Southern Metropolis Daily) When our reporter read the above report, he immediately contacted the Shenzhen Middle Court's Information Office director Li Yujian. On the telephone, Li was shocked, "There is such a thing? Impossible." He immediately called the person in charge of infrastructure construction and then called our reporter back. According to Li Yujian, the eastern plaza of the Shenzhen Middle Court is the principal passageway for litigants. The stair steps were designed too narrowly such that someone tripped and fell two years ago and complained to the court. During the last two years, the court has done two small-scale maintenance project. At the end of last year, the pipes underneath eastern plaza burst and this lead to the ground sinking and the bricks breaking up. This meant that the plaza had to be fully repaired. In consideration of the prior complaints about the steps being too narrow and slippery, the new steps were thicker and that obviously meant the total number of steps is fewer. As for the stone lion in front of the western entrance to the court yard, Li said: "There used to be a stone lion in front of the original office building. Tht stone lion was removed, although the stone stand was still there. In order to have consistency of the appearance of the court houses, we ordered two stone lions, one in front of the original office building and the other at the west gate of the present building. This has nothing to do with warding off any evil." Li Yujian also said: "None of the Middle Court leaders know any fengshui masters." He said that the fengshui talk was defamation. He also said: "I can categorically that the Information Office has not received any request for interview from any media outlet or reporter." Are you confused? Not to fear, because yWeekend's Xu Ying has gone ahead and interviewed the reporters and government information officers. The first to expose the case were <Democracy and Legal Times>'s Guangdong bureau chief Jing Jianfeng and reporter Tian Jiagang. They explained to our reporter just how the story came about. Tian Jiagang: "On May 8, one day after the May 1st holiday week, the Guangdong bureau received a telephone call from our headquarters to investigate the Shenzhen Middle court. Then they faxed the letter from the informant to us." Jing said, "Even on the fax, I can see that the letter was postmarked Shenzhen." Tian said: "After we finished reading the letter, we decided to go to Shenzhen to meet the informant and confirm the facts on location." "The informant enclosed several photographs in his letter, but they do not prove that this information is true. But his identity made us believe him." Tian Jiagang declined to disclose the true identity or any additional information about the informant. Like Tian Jiagang, Jing Jianfeng is confident of the information from the informant. "We went that evening to the Shenzhen Middle Court. We found that the number of steps was decreased as reported. Tian Jiagang and the chauffeur got out of the car and went over to count the number of steps themselves." But just does the fact that there are fewer steps meant that it was changed for reason of fengshui? Tian Jiagang said, "Would ordinary people know the difference between 9 and 11? Would anyone other than a professional make a connection between a smoke stack and an ancestor tablet? ... We absolutely believe that these events took place. First, we observed the changes that occurred at the Shenzhen Middle Court. When we went undercover, some judges said, 'The stone lion at the west gate is there to ward off evil. After the court office was moved, there was a lot of bad atmosphere.' The security guards at the entrance said so too." "Although the informant does not know the contact information for the fengshui master, he knows that the man 'is from Hong Kong and has a thick Henan accent'." During the investigation, the two <Democracy and Legal Times> reporters pretended that they were troubled businessmen calling up fengshui masters for help. Usually, the fengshui masters will boast that they had performed work for this or that office. None of those contacted admitted to doing work for the Shenzhen Middle Court. But that does not prove anything. Concerning the rebuttal published through <Southern Metropolis Daily>, Tian Jiagang said: "On the afternoon of May 10, I took a letter of introduction from my newspaper to go to the Information Office of the Shenzhen Middle Court. I used the reason that I was looking for an anti-corruption story at the Shenzhen Middle Court. I was stopped at the entrance by the security guard and told that I had to have prior approval by the Information Office before I could be admitted. I called the Information Office. A worker said: 'The leader is busy receiving people. He does not have time for you.' The worker also said that I needed an appointment. So I said, 'Get me an appointment then!' The worker said that she will call the leader. I waited for 20 minutes and got no reply . So I called her back. She said that the leader was not picking up the telephone and asked me to leave my contact information. Up till the deadline, I did not receive any call from the Shenzhen Middle Court Information Office." Tian Jiagang then reviewed the history: "I tried to go undercover first before going in openly because the Shenzhen Middle Court often turns down interviews by reporters. In 2005, the sensational An Huijun case was tried at the Shenzhen Middle Court. Dozens of reporters from all over the nation as well as many local citizens were barred from the courtroom. The Shenzhen Middle Court selected a small courtroom with space for 20 to 30 people and allowed only local media to attend. In the 2006, the national media were also barred from the celebrated 'Lu Yu cafe murder' trial. In 2006, FoxConn sued China Business News reporters for 30 million yuan in damages and the Shenzhen Middle Court maintained a total silence and refused all requests for interviews (including Xinhua)." Meanwhile, <Southern Metropolis Daily>'s Qin Hongyan claimed that she called the Shenzhen Middle Court Information Office director Lee Yujian in the evening and got a return call after midnight. So was the Shenzhen Middle Court hard or easy to deal with? This reporter tried to contact Qin Hongyan but the telephone was turned off because Qin was out of town on assignment. Anyway, this reporter began to call the Shenzhen Middle Court's Political Study Group beginning 1pm on May 14. This group was allegedly responsible for communicating with the media. At first, the worker was pleasant enough on the telephone. But after listening to the introduction by the reporter, the worker turned formal and instructed the reporter to call the main switchboard instead. The reporter then called the Shenzhen Middle Court switchboard. All his calls were routed to the Information Office (Media Liaison Office). Either nobody picked up or else there was a busy signal. The reporter called until 4pm without being able to get through to anyone. At 11:20 on May 15, a man picked up the telephone at the Shenzhen Middle Court Information Office. He kept asking whom the caller wanted to talk to. "I am a reporter with <yWeekend> and I want to know the veracity of the reports that the building renovations at your court were connected with fengshui ..."
Before the reporter could finish, the telephone was cut off. Another odd thing was that the original article in <Democracy and Legal Times> referred only to "a certain local court in Guangdong province." It never identified the Shenzhen Middle Court as such. So it was strange that the various re-publications in other media had different versions. On May 14, <Huaxia Times> referred to "a court" in the title and "a certain middle court somewhere in Guangdong province" in the text. 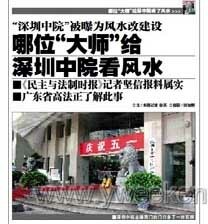 On the same day, when <Beijing News> carried the story, "a certain local court" became "Shenzhen Middle Court." The <Beijing News> editor said that the change was based upon information provided by <Democracy and Legal Times>. Tian Jiagang sent the original draft of the report to this reporter and it clearly stated that the court was the Shenzhen Middle-Level People's Court. Why was the identification removed? Tian said, "I asked the editor why. He replied that the name was hidden in order not to damage the court too much, especially since people think that there is hostility between our newspaper and the court." According to Tian, they had a bad fallout as a result of the coverage on the "five corrupt judges at the Shenzhen Middle Court." So we are still stuck with not knowing for sure about the role of fengshui here. However, there is no doubt that the Shenzhen Middle Court Information Office is brain-dead with respect to crisis management and media liaison.